Instead of the using the general terms in the dashboard for what's occurring (e.g. 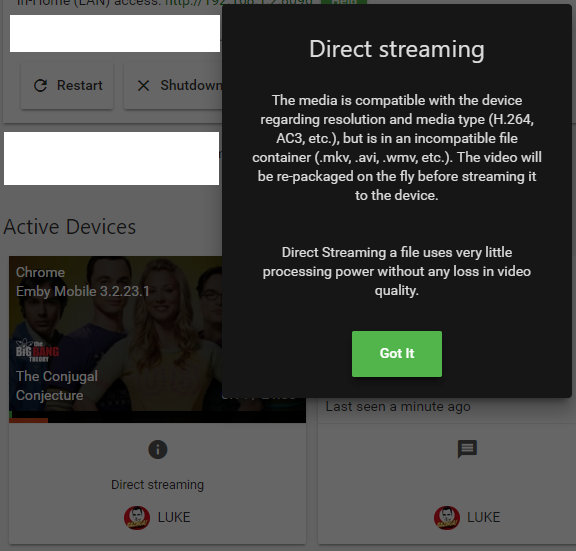 "Direct Streaming"), just have it say exactly what is occurring so there's no confusion. Only the admins of the server are going to look at the Dashboard and presumably they'll understand it decently enough. The wife and kids won't be looking at it and won't care. Or show both the general term and the finer details. Stop making us hunt through logs to understand what's doing what and why. Edited by zigzagtshirt, 11 July 2017 - 03:52 PM. I wonder if any of our suggestions are being considered? Stop making us hunt through logs to understand what's doing what and why. I mean that's a step towards being more helpful but all that's doing is displaying a definition that we already know. Still leaves us to hunt through the logs/research why something is being transcoded or repackaged. What I'm talking about is listing the specific details of the situation like what you would see in a log, except in more understandable language. Edited by zigzagtshirt, 12 July 2017 - 08:58 AM. 10 minutes into that movie user b and c log on to watch a video, what happens? does user a's transcoding get reduced to balance the other 2 or do user b & c only get 5mb/s? The server does not balance speeds when additional users connect, basically what every bandwidth the server has available at the time the playback starts. You can allocate specific bandwidth to individual users or set a global bandwidth set for all users. Hi, sorry to bumped up this thread but I'm a new user of Emby but I cannot for the life of me figure out how to display the image above when I stream from my PC to my HDTV via Emby. Is there a setting where you go to to have that shown as the above image? Thanks in advance. That's what you see in your server dashboard, when you play something. I don't see anything like that when I stream from PC to TV. If you're looking for it in the player, it's not there. Where did you install the server? Emby is installed on my PC. When I click on the Emby icon on the task tray it open in Chrome and the image below shows the Dashboard whenever I stream from my PC to the TV via DLNA. It does not show whether the video is direct play, direct streaming or trans coding. Oh, if it's DLNA, you won't have the same information. I think I know what is going on. 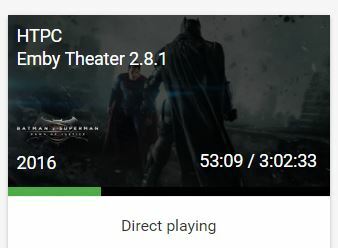 If I access my video files by selecting "from" my TV then the Dashboard won't show it but if I play the file from my PC via DLNA to the TV then it will show whether its a Direct Play, Stream or Transcode. Thanks for your help though. Edited by michael.angelo, 19 August 2018 - 07:24 AM. That's correct. We still have a little work to do with DLNA to support progress monitoring on all devices, in all situations. Thanks.